A town in ruins still has many memories to cherish. It was an ethereal experience, walking among ruined buildings on an almost moonless night, with only the flickering lights of candles to guide our steps. Branches of invading trees clawed their way up the old stone walls, looking like the tentacles of a giant wooden octopus covering the buildings. You could almost imagine the ghosts lurking in the shadows. Papan is one of the smallest and oldest towns in Malaysia, and part of its charm is that half of the town lies in ruins. It is almost a ghost town, yet many of the buildings are still occupied. Some have even been freshly painted. 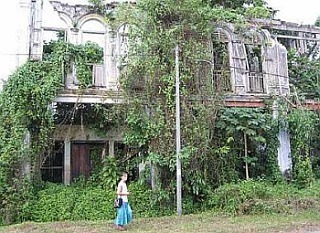 Falling apart, but still interesting: Part of the charm of Papan, Perak, is that half of the town lies in ruins. It was incongruous to see a row of three buildings, one a total ruin, the next one sporting a new coat of paint and the third in its original state. Facing these, across the road was a row of derelict buildings with trees almost covering the masonry, and birds swooping in and out, enjoying the wilderness.No. 74 Main Street, Papan, must be one of the most famous addresses in Perak. It was from this building during the Japanese Occupation that Sybil Kathigasu ran a clinic with physician husband, Dr. A.C. Kathigasu. They gave medical aid to the Perak People Anti-Japanese Army (PPAJA) and Force 136 operatives, who were hiding in the hills of Papan. (The PPAJA was later to merge and become the Malayan People Anti-Japanese Army or MPAJA). For her troubles, Sybil was arrested and tortured by the Japanese. She eventually died from the wounds she suffered as a prisoner of war. Sybil, a Eurasian, was the only Malayan woman ever awarded the George Medal for bravery. No. 74 still stands and is today a memorial known as “Sybil’s Clinic Papan”. It is maintained by Law Siak Hong, who has devoted much of his time in preserving and setting up the old clinic as a historical attraction. He has also organised several historical events in Papan. Law is president of the Perak Heritage Society (PHS), and it was due to him and also the PHS, that the “Papan Memories” night took place on Aug 18 to commemorate the 50th anniversary of Merdeka and the 62nd anniversary of the end of World War II. A pleasing number of people turned up for this event, many of them expats living in Ipoh and KL. It was a good chance for people to look around No. 74 and to learn a bit about the history of Papan through the photos and exhibits on display. Papan has always been associated with tin, but its name Papan means “plank” in Malay and probably refers to its early days in the mid 19th century when the settlement came into being as a timber town. At the time about 200 Malays and 200 Chinese worked there in a lumber settlement. Then immigrant Mandailings from West Sumatra came to Papan after the Klang War, and settled in late 1870s and early 1880s, after their leader, Raja Asal was awarded mining rights to the land and later the penghulu-ship. By the 1880s Papan was an important area for tin mining, with 13 mines in operation. A dam was built by the Mandailings, possibly with the help of the Chinese, to supply hydraulic power to the mines. More Chinese arrived in Papan to work in the mines and the town grew. Due to the abundant alluvial tin, Papan grew rich. Streets were laid out by the 1890s and, by the turn of the 20th century, the main street had more than 100 shophouses and public buildings. Morning markets were held at the lower end of town. There was a school, post office and government dispensary. Entertainment was confined to the upper end of town, where there was a Cantonese opera theatre, brothels and opium dens. The Papan mosque was completed in 1888, built in the character of the mosques in Mandailing. It has a large timber hall raised on piles and a double-tiered roof. The mosque still stands today, next to the Rumah Besar, which was built in 1896. The original Kwan Yin temple was built in 1874. Many of the mansions and other buildings are still in existence today. The town grew in population during the Japanese Occupation. Thousands of war refugees fled to Papan in December 1941, after the Japanese bombed Ipoh. Papan acquired the reputation of being “a bad place” during the Occupation, for the MPAJA and Force 136 operated here. It was during this period that Sybil and her husband ran their clinic. Examples of medical tools and medicine bottles used then are on display in the clinic. Looking around the exhibits is a moving experience when you think of the atrocities that took place. Having learnt the history, some visitors went for a boat ride on a mining pond at the back of the town. Others went exploring and ventured into some of the ruins. Trees are taking over and invading these houses, some of which still have old furniture in place. Amazingly, some houses looked deserted, but are still lived in. At dusk everyone gathered for a buffet supper of local delicacies and war-time specialties. For some of the foreign visitors, it was the first time they tried tapioca. There was even a large birthday cake for Malaysia’s 50th Merdeka. After eating, everyone went to the basketball court for a short performance by dancers from Yuk Choy High School, Ipoh. The first dance, Do Not Discard, was all about remembering our past, traditions and heritage. The second featured 1930s music to reflect Papan’s days of glory. It was the perfect setting – the area was lit by candles and the dancers were illuminated by car headlights. The music and costumes completed the effect. After the last dance, the spectators picked up the candles and, led by Law, went for a candlelit walk around the ruins. If there are any ghosts in Papan, they were in hiding that night. At least one house, No. 2, is reputed to be haunted. Papan is a fascinating place, and hopefully will remain standing for decades to come. WHILE Italy is proud of its world-renowned Leaning Tower of Pisa, we too have our own, the Leaning Tower of Teluk Intan. 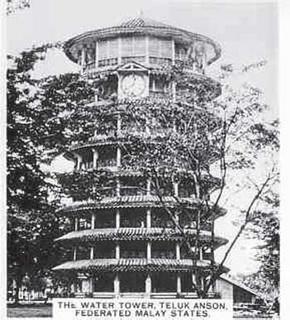 The pagoda-shaped tower is a major tourist attraction in Perak’s third largest town. This historical landmark was originally built by a contractor, Leong Choon Cheong, in 1885 as a water storage tower for the 800 residents in the area. At the same time, the 25.5m building also served as a beacon to guide ships into Teluk Anson as the town was called back then. Apparently, the original name of the town was Teluk Mak Intan, named after a wealthy Mandailing cloth trader. Legend has it that Mak Intan lost a diamond hairpin while playing in the bay and so the name was given to commemorate the incident. Then in 1882, it was renamed Teluk Anson in honour of the last Penang Lieutenant-Governor, Major-General Sir Archibald Edward Harbord Anson who was said to have drawn up the modern plan for the town in the late 1890s. In 1982, during the town’s 100th anniversary celebrations, the Sultan of Perak proclaimed that the name would be changed to Teluk Intan. Originally called the High Clock Tower, the building appears to be eight-stories tall but in reality, there are only three different levels with the water storage area at the highest position. This brick and wood structure started tilting in a north-westerly direction about four years after it was completed. This was attributed to ground movement caused by an underground stream that was not detected when the site was selected. During two major floods in 1889 and 1895, the lower section of the tower was submerged. It was used as an observation post during the Japanese Occupation due to its height. After the war, it became the Boy Scouts headquarters. Today, its only function is as a clock tower. Despite its age, the clock which was manufactured in London more than a century ago, still chimes without fail every 15 minutes. The photograph shown here was taken from a complete set of 24 large photographic cards entitled Malayan Scenes, issued by Carreras in 1928. Clearly at that point of time, the tower, located at the end of Jalan Selat, did not show the high degree of inclination that is visible today.